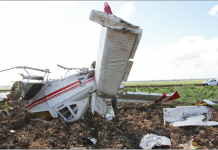 What led an experienced, highly trained and well-rested crew into deadly error? 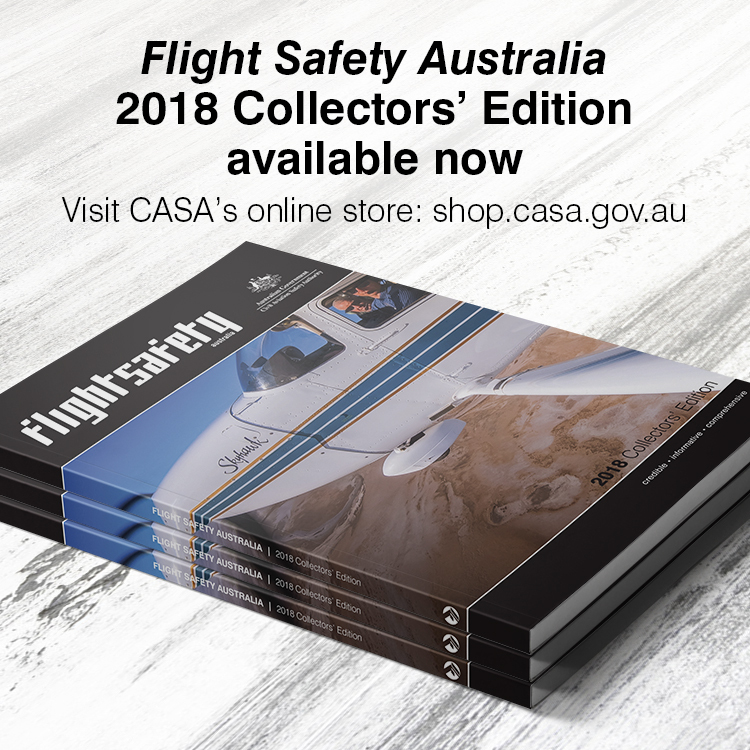 Flight Safety Australia contributor Max Collins investigates. The captain instructed his crew to take their time, and not allow themselves to be rushed, despite the approaching typhoon. Yet a few minutes later the flight crew tried to take off on a closed runway that had construction equipment and concrete barriers on it. 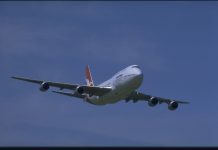 The impact destroyed the Boeing 747 and killed four crew members and 79 passengers. The weather at Taipei on the evening of 31 October 2000 was in continuous decline as the approach of Typhoon Xangsane brought increasing wind and rain, decreasing visibility, and low cloud. It was not pleasant weather for flying, but air transport aircraft frequently and safely operate in weather that is not pleasant. In a metaphorical sense, that those knowledgeable about aviation and safety management would recognise, this unpleasant weather was a slice of Swiss cheese. We could call it slice one of a more than dozen slices which, to use James Reason’s model, lined up that dark and stormy night. The accident drove straight through the aligned holes in this imaginary substance. Singapore Airlines flight SQ006, a Boeing 747-400, having landed at Taipei’s Chiang Kai-Shek airport was being turned around in preparation for continuation of the flight to Los Angeles. The crew to operate this flight had come on duty in Taipei. They were well-rested, properly qualified, fit and prepared for the long trans-Pacific crossing ahead. Having concerns about the deteriorating conditions, the captain expressed his desire to shorten the turnaround as much as possible. At the same time he emphasised to the crew that the integrity of the operation had to be preserved. At no stage was any component of the encountered weather below any company or state minima. 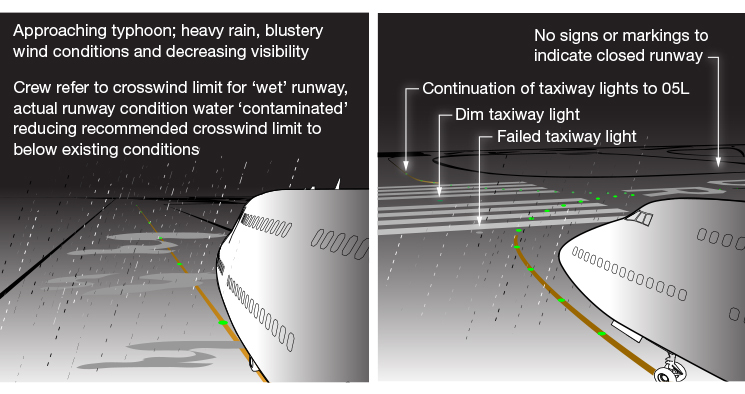 However, it is worth noting that the recommended maximum crosswind for wet runway operation is 25 knots. This is not a limit, but derived from flight testing as the maximum demonstrated ability of the aircraft. Even more important, and critical to what followed, was that the runway was probably not ‘wet’ (that is less than 3mm of water) according to definition, but ‘contaminated’ because of continuous heavy rain that would certainly have exceeded 3mm in depth. This would have greatly reduced the allowable crosswind. That this contamination was never considered became slice two. The report released in 2002 found that neither the airport nor the airline had procedures for judging when ‘wet’ became ‘contaminated’. Chiang Kai-Shek airport (CKS) was served by three runways, runways 05L and R on the western side of the terminal complex and runway 06 to the east. Runway 05L is 60 metres wide, 05R is 45 metres wide. Parallel to these runways is a parallel taxiway NP. It is situated to the south-east of runway 05R. Runway 05R was in the process of being decommissioned as a runway and at the time of SQ006’s operation had both ends available as taxiways, but major works in progress on its centre section. Being night and with hazardous weather at Taipei, there was no activity on this section, but the surface there was severely degraded. Construction machinery and concrete barriers covered the closed area. This was slice three. The crew were aware of these works and the associated notam because they had taken off from CKS several times in recent weeks. On many previous operations, however, they had used runway 06. Shorter than 05L, it offered reduced taxiing but more than adequate length. The captain had not used 05L for some time—two to three years. Although insignificant in itself, this was slice four. The captain elected to use 05L, as its extra length offered greater margins in the inclement conditions. Also considered was that runway 05L was a CAT II runway offering enhanced threshold and runway lighting for the take-off in less-than-ideal conditions. 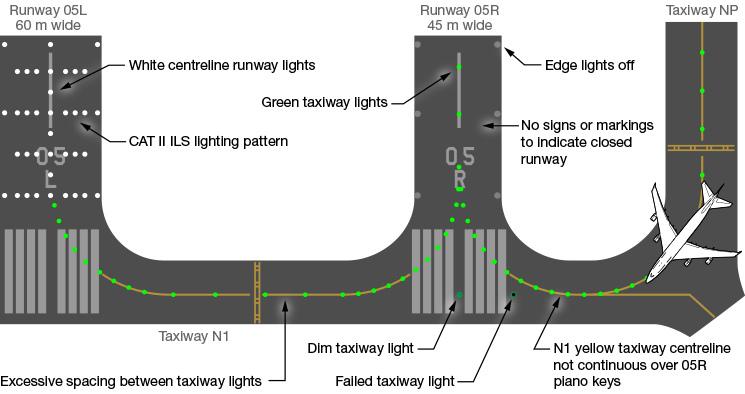 There was lead-in taxiway green centreline lighting on runway 05R but the white runway edge lighting was decommissioned and there were no stop bars. To reach the end of runway 05L the crew had to cross the end of ex-runway 05R and continue about 130 metres. On the night in question there were two problems with the taxiway lighting leading to runway 05L had two problems. The first light beyond the lead-in for runway 05R had failed, and secondly, the next light was not at full intensity. This break in the correct path was the fifth slice. For departure, the ATIS indicated a wind of 020 degrees 36 gust 56 knots, with visibility (RVR) 450 metres in heavy rain. Cloud was broken at 200 feet, overcast at 500 feet. QNH was a low-ish 1001 hPa. ex-runway 05R) it had disappeared from view of the tower operators. Slice number six. Because of the blustery conditions, wet surface and difficulty following green taxiway lighting, the captain had wisely elected to taxi slowly. He particularly made mention of taking the turn at the end of taxiway NP very slowly to avoid the aircraft slipping on the wet surface. This slow ground operation extended the time to the end of the runway and might have contributed to the subsequent event. 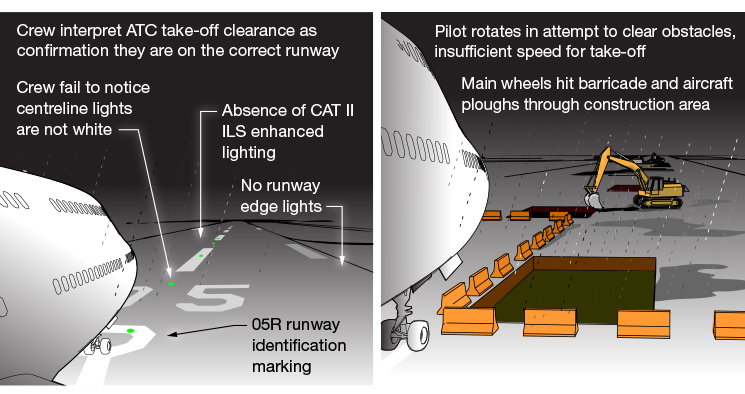 Runway 05L, as mentioned, was a CAT II runway and was therefore served by a CAT II ILS in addition to its enhanced lighting. The aircraft was fitted with a device called a PVD, a peripheral visual display, used as an aid in low visibility take-off and landing roll. This is a small, dimly lit device mounted on the instrument coaming. If an ILS is tuned it will present the pilot with centreline deviation correction during ground roll. It does this by means of a rotating striped ‘barber-pole’ with a horizontal axis. If the aircraft deviates left of centreline the rotation shows the stripes moving to the right and vice-versa. If the aircraft is outside ILS localiser tolerance the display is blank. On this take-off, the PVD was enabled, and tuned into the 05L ILS. Taxi procedures and pre-take-off checks were completed correctly but were interspersed with a significant amount of non-operational, informal conversation. While initially reviewing departure the pilot referred to the runway as runway 06L, reflecting his previous operations onto runway 06. In retrospect, this slip can be seen as the seventh slice. This was corrected by the first officer and confirmed by the third (relief) pilot. The captain corrected his statement. The aircraft was nearing the end of taxiway NP when the tower, whose controllers could not see SQ006, told the aircraft to hold short of runway 5L. This was correctly acknowledged. The tower then told the aircraft that the current wind was ‘now 020 at 24 gust 43’. Cockpit conversation was around the reduction in wind severity. “Getting better” and “Yes, less gusty already”. Just over one minute later, approaching the end of taxiway NP, SQ006 reported, “Ready”. The eighth slice. Tower responded “Roger, taxi into position and hold”. Cabin crew were told to be seated and twenty seconds later the tower cleared the aircraft: “Singapore six, runway zero five left, wind zero two zero at two eight gust five zero. Cleared for take-off”. By now the aircraft had carefully negotiated the turn from NP to N1 and closely following the green taxiway lighting, continued the turn and lined up on the closed runway 05R. Maybe, in the captain’s mind this was 05L as it was a runway on the left side of the airport, compared to runway 06, which was on the right side of the airport. We do not know. The ninth, tenth and eleventh slices lined up quickly. The co-pilot mentioned that the PVD was still covered, the aircraft being well outside the localiser for 05L. This was slice nine. He also mentioned casually that there was a slight displacement shown on the NAV display (slice ten). The captain dismissed the observation by saying vis was OK and that he didn’t need it (slice eleven). Runway 05L was a Cat II runway with bright associated lighting, but the scene from the cockpit was essentially black, with the exception of green taxiway lighting. That nobody on the flight deck noticed this was slice twelve. The landing lights, selected on for take-off, would have illuminated the runway identification 05R but this did not register with the crew, nor was there any mention made by any pilot that the aircraft was not on runway 05L, despite earlier comments that there seemed to be a lack of back-up for the aircraft being on the correct runway. This was slice thirteen, the final cut. Nor was there any mention that the runway edge lighting was not on. Perhaps reduced visibility and heavy rain were a contributor to this. Perhaps the landing light illumination made this omission less evident. At 23:16:44, the engines were set to TOGA (take-off/go around) power and the aircraft commenced the fateful take-off run on a closed runway. Eleven seconds later the relief pilot called “Eighty knots”. The first officer confirmed this and the captain said “OK, my control”. Thirteen seconds later the first officer called “V1”. Just three seconds later the captain uttered an agitated expletive and the words “something there”. One second later, during a desperate attempt by the captain to rotate the aircraft to flight, at well below rotate speed Vr, Singapore 006 experienced its first impact with ground equipment, accompanied by an anguished wail from the captain. All the holes in the thirteen slices of Swiss cheese had lined up and the flight’s apocalypse had arrived. Flight 006, with its crew of 20 and 159 passengers, at a ground speed of 131 knots slammed into several concrete barriers, two excavators, a crane, two vibrating rollers, a bulldozer, an air compressor and a pile of steel reinforcement bars. Pieces of aircraft were later found embedded in these machines. 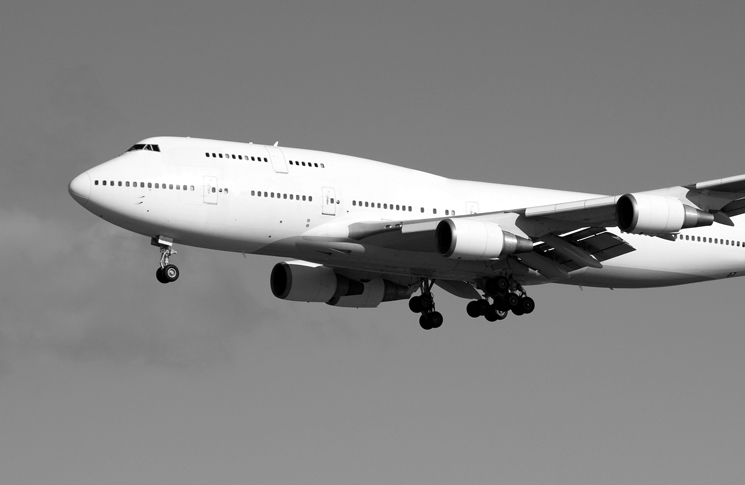 The two left engines separated, causing the aircraft to rotate counter-clockwise, from the thrust of the right engines. As the fuselage turned at right angles to the runway, the tail section, aft of seat row 48, detached and skidded down the runway, losing a tailplane. The two remaining engines came off the wing seconds later. The forward section of the economy class passenger cabin was not survivable, due to impact forces and fire from the centre fuel tank, and 64 of the 76 passengers there died. The separated rear fuselage was the least deformed and fire ravaged, and provided the best chance of surviving. In the detached tail section all the passengers survived, as did the three crew on the flight deck. 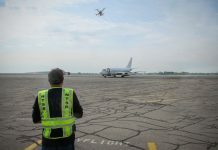 Thirteen seconds after the tower controller saw explosions and flames from the crash he sounded the crash alarm. Firefighters were already on their way. They found the colossal wreck not on runway 05L, but on 05R. The intent of this story is not to apportion blame; rather to identify aspects of the flight that could, if better conducted, have resulted in a safe journey to Los Angeles. Hopefully it will also inspire introspection about the limits of your ability to identify and correct things that do not feel right. No one is immune to error. Experience, rank and seniority can bestow some improvement in wisdom, but ultimately nothing can eradicate human error. This applies to you, not just to someone else. You are someone else to someone else. What the crew should have done is easy to say. Why they did what they did is a much more difficult question, particularly considering their experience, training and the culture of their airline. By definition, they interacted with their environment, which as the official report noted was, in safety terms, deficient. ‘The lack of potential warnings at the entrance to runway 05R did not provide a potential last defence … to prevent flight crews from mistakenly entering runway 05R’, it said. There was no surface movement control radar at Taipei in 2000 (although there is now), and the tower broke its own rules by clearing for take-off an aircraft that it could not see. Post-impact survivability issues emerged. Due to impact forces, two evacuation slides deployed inside the cabin. Others did not deploy immediately and were then blown over by the typhoon winds. What can we draw from such a tragic story? That confirmation biases can warp the judgement of any crew? That seemingly minor environmental and procedural factors, although they may not matter much for most of the time, are nevertheless important? On the rare and unpredictable occasions when the holes in the Swiss cheese line up, they matter very much indeed.